Natural stone cleaning is a delicate process, use the incorrect cleaning solutions and the stone can be damaged or left dirty. To get the best result you need to use professional deep-cleaning solutions along with the correct machinery like rotary machines, brushes, pads along with grout brushes. Bond Stone cleaning carry a number of different cleaners for different problems and different types of Natural stone. DO-NOT use bleach or other household cleaners these will in most cases damage your stone. 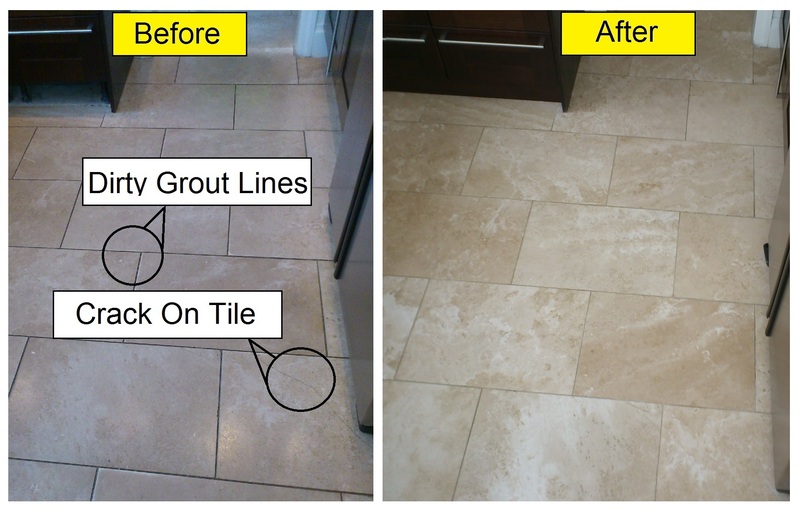 Damage like holes and cracks are common with natural materials, especially travertine. The good news is that in most cases these can be filled with specialist epoxy stone fillers, Bond Stone Cleaning carry a number of fillers to ensure the best results. The only way to get a quality long lasting finish to natural stone is to diamond polish. There are lots of options and some are more suitable than other. Years of experience means that Bond Stone Cleaning uses the right system for each scenario. Some option which are avaliable are Resign Diamond Pads, Flexi Diamond Pads, Wet Polishing and Dry Polishing Systems, Polishing Compounds and MPC. DO-NOT use a varnish type seal to try and get a shine finish, although these have a place it is not advisable for Marble, Limestone including Travertine, or any synthetic tiles like Porcelain or ceramics, they can be used on Slate. If you use them on the incorrect tiles you can get wear on the higher traffic areas of the floor within weeks of applying it. It will also increase your restoration cost if these have been used when they should not. Please see Sealing for more details. 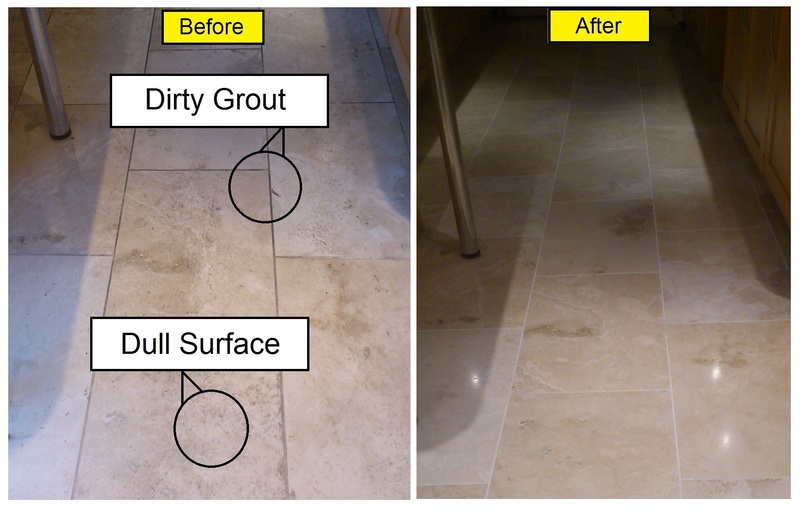 Using the correct seal is imperative to protecting your Natural Stone Floor. Using the correct seal will prolong the life and beauty of your floors as well as making daily maintenance easier. Use the wrong seal and you can lose the beauty of the stone and make daily maintenance difficult. As mentioend above an overseal or varnish like seal should be avoided in most cases. Many do not realise that a lot of Porcelain tiles need regular cleaning and sealing, it is best to ask the retail or manufacture of your tiles to confirm if you tiles need this or not. The correct seal along with the correct aftercare product will keep your stone looking better for longer, much longer. Using a product like bleach or a general cleaner will damage the seal, once the seal is gone the floor will start to degenerate, look dirty and loose the shine faster. Full after-care advice is always given along with details of suitable after-care products. Bond Stone Cleaning are experienced with ally types of natural stone and services like cleaning to sealing, polishing to repairing. The good news is that natural stone can be restored and in many cases look like new once more. Below is a list of some of the services they can provide. The above covers just some of the main service however please call with any natural stone cleaning, polishing or restoration questions. Bond Stone Cleaning are experience Natural Stone Restoration experts, specialising exclusively in natural stone, marble, travertine, limestone, slate, granite etc.